With the recent and rapid growth in both freeskiing/freeriding and backcountry skiing, more and more people are leaving the safety of groomed trails for the raw thrill of speeding through trees, cliffs, and chutes. However, the increase in adventurous folk traversing expert level terrain has subsequently increased the possibility of triggering the most dangerous event of a snow sports enthusiast’s life–the avalanche. Capable of reaching speeds of 80 miles per hour and consisting of many tons of snow and ice, avalanches possess such extreme amounts of force that it is practically impossible to escape from one when caught. Anything unfortunate enough to be below one will be sucked into it, and tossed around by the vortex created by tumbling snow. However, this isn’t even the deadly part. Once the avalanche has reached the bottom of the slope, the snow settles into a dense pack with consistency nearing that of concrete. Anyone caught plays a game of chance: either they are only partially buried and have the ability to escape, or they are fully submerged below the snow. When completely buried, it is impossible for someone to move, and the constant tumbling from being caught in the avalanche leaves them disoriented, not knowing one direction from another. Furthermore, the density of the snow leaves little space for breathable air. The result is a survival time of 15 minutes, beginning as soon as the snow sets. With such high stakes, ski patrol need to act fast whenever an avalanche takes place. But they cannot predict where and when an avalanche can occur, meaning that response time is key to successfully saving lives. But when dealing with the challenging and unstable terrain of an avalanche site, it can often take too long for ski patrol to reach the victims. Enter two devices, Airborne Avalanche Rescue Assistant (AARA) and Alcedo. Both are conceptual, quick response, autonomous helicopters currently being developed for use in rescue operations for avalanche victims. These systems will have the advantage of far faster and more accurate victim location than any grounded person could ever achieve. The approach for each device is slightly different. AARA, a vision of product designer Tatjana Rolle, is designed to be part of a fully autonomous system that integrates the drone with a network of motion sensors mounted in known avalanche hot spots around a ski resort. Once the sensors identify an avalanche, the drone is automatically sent from its charging station and navigates via GPS to the incident, where it scans the area for special RECCO reflectors, standardized passive devices found in most winter clothing that can pinpoint a wearer’s location. If the AARA identifies a beacon signal, it will mark their location with high visibility paint and relay the GPS coordinates to nearby ski patrol for immediate extraction. Currently, the AARA concept utilizes a pair of counter-rotating blades mounted centrally within a gimbal assembly and is surrounded by a composite shell. It navigates by angling the blades in its direction of travel. Alcedo is designed to be a more compact device, capable of being folded and stored in a ski patroller’s backpack. The drone utilizes the more traditional quadcopter architecture, making it particularly capable of operating in windy environments. Alcedo is designed to be used by the patroller as soon as he or she reaches the scene. It quickly unfolds and deploys to rove the area, using GPS as a guide. Additionally, it employs ultrasound sensors in order to remain at a constant height of 2.5 meters from the site, assuring that it does not collide with the patrollers. The smaller Alcedo does not have the payload capability for a RECCO system, and instead searches for signals from active avalanche beacons, special devices worn by backcountry skiers to track their location. Although not as common or integrated as RECCO reflectors, avalanche beacons are worn by most skiers who know they ski in avalanche zones, and are more accurate than reflectors. Once the Alcedo finds a signal, it drops a small smoke beacon, making the target clearly visible to the patrollers. In the distant future, the Alcedo could even become viable as a common find in any backcountry skier’s safety arsenal, just like avalanche beacons and shovels. At this time, however, the Alcedo remains a prototype. Even more ambitious is the Telluride, CO based startup known as Mountain Drones. The startup is being funded as part of this year’s Telluride Venture Accelerator, a special business mentorship program, and has been developing its drone since 2013. Unlike other avalanche drone concepts, Mountain Drones aims for preventative safety by developing a drone that can scan for snowpack information and mitigate possible avalanches. 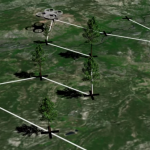 Mountain drones is still securing patents for its designs and is therefore not sharing specifics publicly, but promises it has working prototypes that have been developed to survive Telluride’s harsh winter weather conditions, as well as an eventual goal of replacing the dangerous work of traditional dynamite and cannon based avalanche control with its automated drones. Even though all of these systems are still in early design phases, they continue to show promise for the practical use of small autonomous aircraft in extreme environments. If any of these devices enters production, it will have the capability to both save lives and reduce risk to people helping save those lives.